Upgrade your sleep with this oversized quilt set from Southshore Fine Linens. 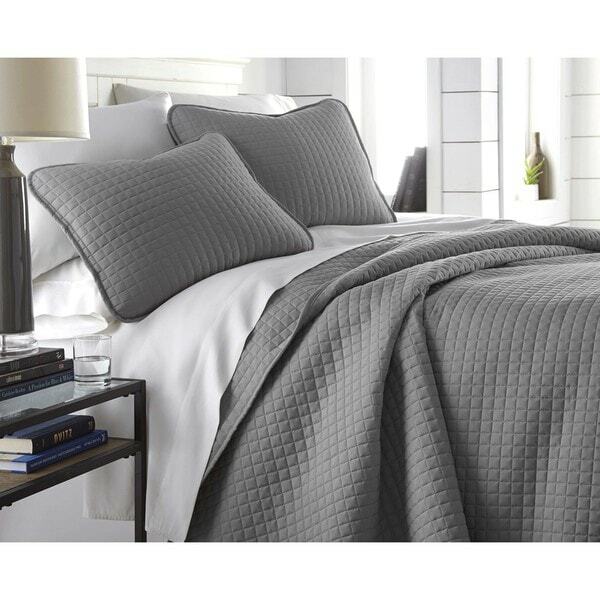 This microfiber set includes a large quilt and two pillow shams with a subtle geometric waffle-like pattern. Each of these items is machine washable and available in a range of fashionable colors. I didn't know what to expect, since I usually prefer to purchase 100% cotton matelasse coverlets for my bed. But this one feels exactly, if not softer that my last cotton coverlet. The weight is perfect for me - I expect to be able to sleep under for 9 out of 12 months of the year. I live in the Hudson Valley of NY State. Since I do not have a dust ruffle or box spring, I purchased a King size set so that it would extend a sufficient length over the sides of my Queen size bed. It hangs about 17"-20" over the sides and bottom of the bed, depending on how accurately I center it. This works perfectly for me. I will definitely purchase another like this for my bed in the city. Very soft and plush and comfortable. Pillow shams are a good size as 20 inches by 30 inches and a nicely tailored style. The size is great, a few inches wider than a normal queen. I ordered the light blue, and the color is true to the quilt on the website. It's lightweight and perfect for New Orleans nights. The weave is nice and tight, all seams are straight, and the quilt "plumped up" nicely after machine wash and dry. Shams are very nice, too, and fit the standard pillows I have perfectly. I wanted the PB look at the Overstock price, and this is very close! I was looking for the perfect quilt set and was very happy with this one. I like the quilted pattern and the grey shams are perfect with my grey headboard and grey, white and blue comforter set. We bought the queen for our king bed because we don't like a lot of bulky blankets under the comforter and it fits just fine with about 4 inches hanging down on each side. It washed well with no wrinkles. I am so happy with it I am ordering another in white for the guest room. I have a cat who sleeps at the end of our king sized bed. Therefore, I need to wash the bedding, including the speread or cover letter at least once a week. Comforters are too big to fit in my large capacity washer, so a quilt or a spread is required. This looked just right for my transitional style bedroom. When I opened the package, I was pleased with the material, the weight, and the color of the quilt and shams. Because I ordered the king sized set, I the shams were also for king sized pillows. I would have given this five stars if it only had been wider. 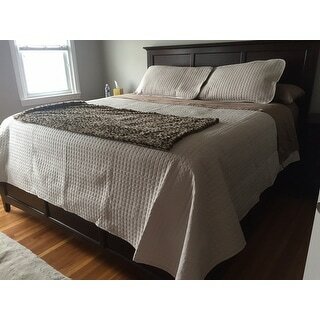 As with all the other quilted bedspreads I have tried, the quilt is not wide enough to cover both sides of the bed down to where the bedskirts begins. This problem makes the bed look unkempt. Because this quilt was very reasonably priced and was quilted (sewn) with straight lines, It is possible to buy two of them, cut them to fit the entire width you need, and sew them together. It requires more talent with scissors and the sewing machine than I possess, so I had my seamstress do it. Now it looks great, but is no longer an inexpensive investment. I like how the quilt actually hang about 16 inches over the side of the king size mattress. The quality seems top notch too. Just received this yesterday.We are very happy with this purchase. We received it within 3 business days of ordering it with only 2.99 for shipping. We ordered the sage which is more of a lovely avocado color. The picture in the item information is pretty much what you get....at least on my computer screen. It is exactly what we were looking for in a lightweight coverlet to replace a much too bulky duvet covered down comforter we had on our bed in our motorhome. The fabric is very soft. The coverlet is very well made. It has grid quilting.....very attractive and will accessorize well with our own decorator pillows and a nice throw. I definitely recommend this if you're looking for a high quality, soft, and price is exceptional bed covering. 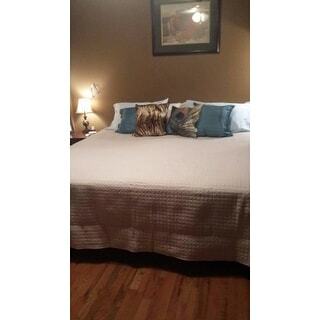 The queen size is 92 x 92 and fits our oversized queen perfectly. Couldn't be happier with this purchase for our intended use. I honestly wasn't expecting much for a $50 quilt set but I love it! I ordered the sage and the color is perfect. It is great quality and the stitching is strong. It is oversized, despite what other reviewers have said. It's a good 18 inches wider at least than other King sized comforters or quilts I have. It is very lightweight; I can wash it in my normal washing machine without overfilling it. And the fabric is very soft and comfy to lay on top on if you like lounging on your bed. Now I'm debating which color to buy next! Very pleasantly surprised !!! Great price and great quality.. I bought the queen and thank goodness it is oversized as I have a 4 inch topper on my mattress. The fit is perfect. I also like the off white color, it allows different colors of pillows. Good quality but not really "over-sized"
Great Quilt for all seasons! I was looking for a true oversized king quilt. This one is perfect. It's lightweight but not flimsy. The fabric seems to be good quality, and the construction is solid. The color is perfect. I'm very pleased with the set. We ordered this set in two colors and both are beautiful. Very crisp & tidy look! My husband and I were looking for a cooler cover for the summer months. However, I like to sleep under something with a little bit of weight. This hit the mark - cool enough for my husband and weighty enough for me. Excellent quality. Highly recommend. Best comforter I've ever had! We have a California king sized bed and nothing would fit it. Everything I would buy would leave either side exposed, it looked trashy. But when they say oversized they mean it! It has a ton of over hang on either size of the bed so it doesn't expose the mattress and box spring underneath and my husband and I aren't fighting over the covers at night. Enjoying this new quilt set. I was very happy to unpack this quilt from its packaging. The color was spot on and it fit my California King bed perfectly. It is light in weight but has been great in keeping us warm on the cooler fall nights we have been having. I think the thing I like the most is how well it fits and looks. It has a very elegant look and just looks finished when you make the bed each day. I would recommend to other and also buy again for another room in our house. Beautiful color and extremely soft. This quilt fits my king size bed perfectly. I'm going to order another one. This is the second time i have bought this quilt set. I was so pleased with the quality, price and color choices i bought a different color this year. Excellent selection of colors and they are true to the picture. Quilt is over-sized and durable even after many washes. This quilt set is perfect for our guest room. We wash it about once a year or after guests. It suits our needs perfectly, however, I don't know how it would wear under regular use. Love! Stiffer than any coverlet I’ve ordered in the past, but I’d assume it’s going to soften up. Lays so nicely and looks great! The pattern is subtle but still gives some life to our simple bedding. Good quality for price. Very happy with looks and fits well.. The full sized spread I purchased was well made and made a wonderful addition to my bedroom. 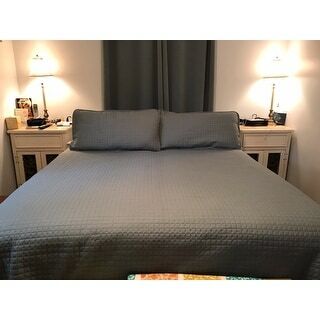 The pillow shams that came with it were of high quality and since I have change the size of my bed, I was able to pass these items on for others to enjoy! Overstock.com is a place I would recommend to anyone! This set looks stunnng in my newly decorated bedroom. I highly recommend it. Very good quality and looks great! "what are dimensions of King"
The King size dimensions are 98 inches x 108 inches. "What are the dimensions of the Queen? 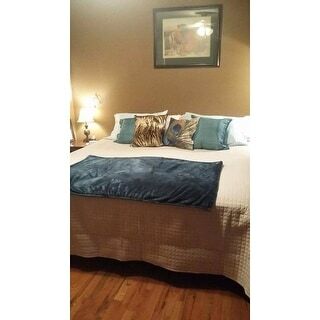 It says oversized but 92 x 92 is not oversized for Queen, and will not fit my queen bed." queen size mattress is 60"W x 80"L, you will have ample overhang on both sides and at the foot, it is not designed to go all the way to the floor like a bedspread is., it is more of an over sized coverlet. "Is the off white yellow? I want a true off white, not yellow!" "In the Ski Lodge decorated room pic, is the color of the quilt there the steel gray or the sky blue? I can't really tell." "What are the measurements on a queen and king size?" I don't know, however I ordered the king and it goes to the floor all the way around. I was very pleased! "Is this quilt polyester, cotton or blend?" The tag on my quilt says it is 100% cotton. Odd. My tag says 100% polyester fibers. I believe it is microfiber, as are the sheets. The twin size I bought for my daughter has been washed multiple times, and it has held up beautifully. I can't see that it has shrunk at all, so I doubt it is cotton. "What are the exact dimensions of the California king coverlet? Thank you. Susan G"
King/ California King: Quilt: 98 inches wide x 108 inches long. Shams: 20 inches wide x 36 inches long.